Few presidents are as revered, as disliked, or as influential as Ronald Reagan, and not many books offer such an unvarnished appraisal as this one of the fortieth president. The author is professor of history at McGill University and the author of two well-received books, Mr. and Mrs. President: From the Trumans to the Clintons, and See How They Ran: The Changing Role of the Presidential Candidate. Here, he presents a fascinating investigation of the Reagan presidency and how it impacted and, in turn, was affected by, 1980s culture. The Reagan era, the author suggests, was a time of reconciliation, not revolution, since the eighties was the decade that came to terms with the sixties. Reagan did not dismantle the New Deal / Great Society programs, and feminism, environmentalism, and racial progress in the workplace flourished during this decade. It was an era of good feelings, in which Reagan inspired people to feel pleased about themselves, a welcome respite from the turmoil of the administrations of Johnson, Nixon, Ford, and Carter. Troy skillfully recounts the underside of the eighties: there was excessive greed, the Iran-Contra scandal, the 1982 recession, and the 1987 stock market crash. Reagan, as the author claims, “employed many scoundrels who hated government spending unless it profited them.” More than a thousand Reagan officials were indicted, compared with only fifty in 1970. These calamities were balanced by an overall strong economy, progress in the fight against AIDS, and Reagan’s important role in encouraging Soviet Premier Mikhail Gorbachev’s fight to rid his country of Communism. 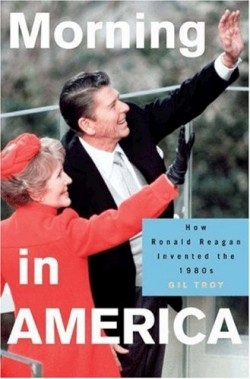 Reagan, the author concludes, was not as successful or as popular as he is currently portrayed. After his 1981 successes in reducing taxes, increasing the defense budget, and decreasing the size of the federal bureaucracy, legislative gridlock became the pattern for the next seven years. Yet, the shadow of Ronald Reagan looms large. Both President Bushes emulated him, and Bill Clinton, the only Democratic president since before Reagan, decreed “that the era of big government is dead,” a mantra that pleased Reagan. This book is a welcome relief from the proliferation of uncritical, hagiographic remembrances, and from earlier works by officials whose books were vendettas against the enemies they made while working for Reagan. Although the author tends to overemphasize the importance of a few television shows in defining the era, and at times he lapses into florid prose to substantiate a point, this is an important work that general readers will enjoy and historians will consider before doing serious research on the Reagan years.